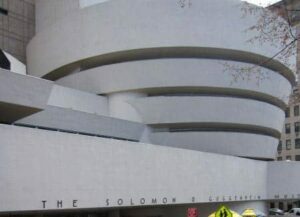 The Guggenheim Museum in New York is one of the most beautiful buildings in the Upper East Side, perhaps in the world. The building itself is reason enough to include it in your top 5 “things-to-do-when-in-New-York.” Is there anything worth seeing inside the building? Of course: in addition to it’s permanent collection, the museum organises fantastic, temporary exhibitions. The curators spend a tremendous amount of consideration when creating them. 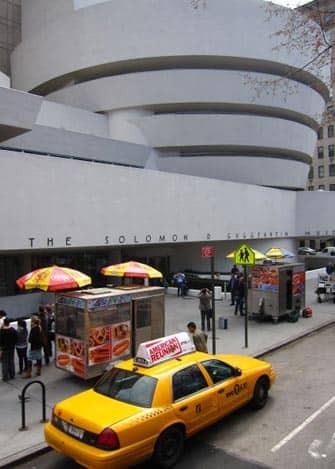 Upon seeing it for the first time, most people assume that The Guggenheim is a modern building. However, it was actually constructed in 1959 by Frank Lloyd Wright, one of America’s most renowned architects. The most noteworthy feature of the building is the upper rings which are much wider than the lower ones, giving it that other worldly shape. It looks almost alien: probably the reason why it was featured in the movie Men in Black. The inside of the building is almost just as special as the outside. Instead of individual floors, there is one large upward spiral. From there, you take various exits to view the different rooms. Eric’s Tip: Feeling a little tired? Or have difficulties walking? After you’ve entered, take the lift to the top floor so that you can walk down the spiral. The Guggenheim has, for the most part, temporary exhibitions that are very good. However, their permanent collections are also a worthwhile visit. These are the Thannhauser Collection and the Guggenheim Collection. The Thannhausers were successful German art dealers in the beginning of the last century. They were known for spotting which painters were going to make it, and which were not. This allowed them to build a wonderful collection. Including, among others, Picasso, Van Gogh and Cézanne. The Thannhausers and the Guggenheims became friends. 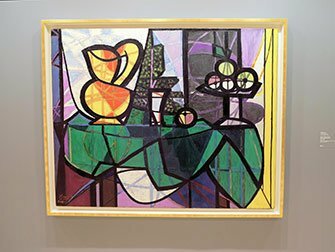 As they had the same views on art, they left their entire collection to the Guggenheim Museum. 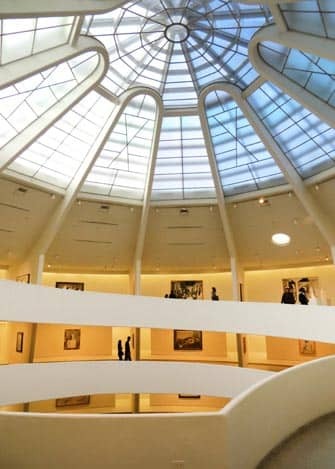 The Guggenheim Collection shows early modernist works. Artists whose masterpieces are featured, are among others Marc Chagall, Vasily Kandinsky and Piet Mondrian. The collection showcases a range of art from Europe and Russia, from the second decade of the 20th century. After walking three levels you are probably going to need a coffee. This has been taken into consideration as there is a Coffee corner (called Cafe 3) where you can enjoy a delicious espresso or cappuccino and cake. The view? Central Park, not bad! Do pay attention as it’s quite secluded so easy to miss. Feeling hungry? Head down to the ground floor. On 88th Street you will find “The Wright”, a good but rather small restaurant. 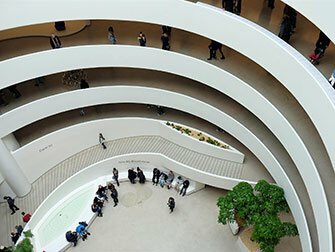 Eric’s Tip: Entrance to Guggenheim is included in the New York Pass, New York CityPASS and Explorer Pass.